Sometimes you just need a break. From work, from routine and from stressful over-scheduling. But planning a trip can be daunting and -- more importantly -- expensive. (In my next article, I'll also be offering some tips on how to make your travel planning process simple and stress-free!). If the thought of air fare and hotel fees gets you down, try spending your time off in your own city! Taking the time to rediscover the area you live in can be truly worth it. Here are some ways to approach your home with fresh eyes and get the most out of your staycation. As a Bay Area native, I try my best to stay away from all the tourist-y areas of San Francisco. To me, cable cars are slow and inefficient, Alcatraz is a complicated boat ride away, and Fisherman's Wharf just smells funky. However, I've learned that there's a reason these activities are so popular. My family, despite my pleas against it, once roped me into a segway tour through the city. However, after I got over the sheer embarrassment of riding around like a mall cop in a reflective vest, I actually enjoyed myself! I learned all about the city's history and geography, all the while discovering that the segway is an underrated and exhilarating mode of transportation. You begin to take your city for granted once you've lived in it for years. So throw yourself into the tacky activities that you might otherwise be averse to -- you just might learn something. Doesn't look too bad. . . right? Image via TripAdvisor. When we commute, we often ignore the environment around us and let ourselves get caught up in traffic-induced anger. Try walking to a local restaurant rather than driving, and take in the sights and smells of the place you live. Sure, it might take up a bit more of your time, but you're on staycation! Remember -- this is a time to keep your mind off of your schedule. My favorite thing about walking is all the hidden gems you find, like hidden stairways and hole-in-the-wall shops you'd never notice from a car. There's been a recent "self care" trend happening lately, and I'm all for it. During a busy work week, it's hard to find the time to pay attention to yourself! So take your mind off work and turn your home into your dream resort & spa. One of my favorite things to do is draw up a nice bath and kick back with a glass of champagne, magazines, and a box of macarons (a la Blair Waldorf). I try to use every little thing I can to make me feel my best that I typically never have time for -- candles, face mask, relaxing music. . . the works. It makes the evening feel a bit more vacation-y, and who doesn't love a good charcoal mask? That's right. . . I made these (with a lot of help). When I tell people I've never seen The Notebook, Ferris Bueller's Day Off, or Breakfast at Tiffany's, you would think I told them I haven't been alive for the past twenty years. I love movies, but to be honest, I've just never had time to watch some of the "classics." For those of you in a similar situation, compile a list of films you've been meaning to see, invite some friends over, and try to knock them all out in one night in a movie marathon. If that means falling asleep after the first two with a glass of wine in hand, is it really a loss? If you've ever spent hours waiting for a table at a new restaurant on a Friday night or skipped out on that café you've always wanted to try due to a huge line, go on a weeknight or afternoon when the crowds are much thinner. Maybe eat like a European and have dinner at 9:00 -- after all, every night is a Saturday night! Even if you run into a line, you'll be able to justify waiting if you've got the entire day to yourself. In any city, there's a ton of free activities that go undiscovered, even by many of the locals. If you search for them, you can find countless ways to immerse yourself in your city without dropping a dime! If you live in New York, San Francisco or L.A., you can find my approved lists of free activities here, here and here. If you're based in a different city, here are some great ways to discover cheap local activities. A (free!) 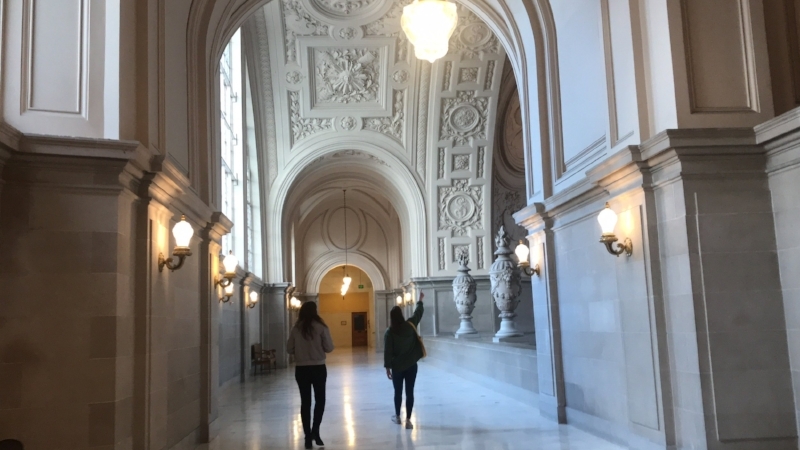 tour of San Francisco's beautiful City Hall. One of the best ways to get to know a city (even the one you live in!) is to interact with the locals. On verlocal.com, you can find countless workshops, classes and experiences in your area hosted by local businesses! Sign up for a cooking class or crafting workshop to get the most out of your stay and pick up a new skill. This takes the pressure off of you trying to figure out what to do (your day is pretty much planned for you), and you might find a new skill that you never knew you might enjoy. I was always averse to kitting, but a single Knitting 101 workshop and three scarves later, I've fully embraced my inner grandma. One of our ceramics workshops in San Francisco. Hopefully these tips will get you on your way to a chill few days of R&R, and you just might emerge with a bit more knowledge of the place around you than before.